Hayes Hudson's House of Horror: Have you seen the trailer for the new film, HEREDITARY? Have you seen the trailer for the new film, HEREDITARY? When Ellen, the matriarch of the Graham family, passes away, her daughter's family begins to unravel cryptic and increasingly terrifying secrets about their ancestry. The more they discover, the more they find themselves trying to outrun the sinister fate they seem to have inherited as it slowly destroys everything they know. Making his feature debut, writer-director Ari Aster unleashes a nightmare vision of a domestic breakdown that exhibits the craft and precision of a nascent auteur, transforming a familial tragedy into something ominous and deeply disquieting, and pushing the horror movie into chilling new terrain with its shattering portrait of heritage gone to hell. 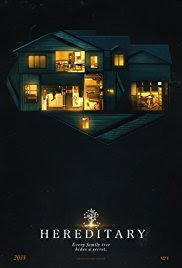 HEREDITARY was written and directed by Ari Aster and is scheduled for a June 8 release. Check out the trailer and leave a comment to let me know what you think!